Posted on 2/28/2017, 2:39 pm, by kittykill, under Tute Tuesday. Shake off those winter blues! It is time to pack those bulky sweaters away for the season and start thinking of fun spring clothes. 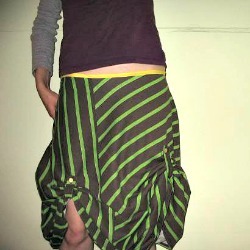 KScline has the perfect outfit to celebrate the change of season with her tutorial for a French Inspired Dual Action Skirt. You can wear this skirt down for work and then hoist it up for a night on the town. Ooh la la! Look at you! Our Clothing Board is the place to check out the latest spring fashions. Don’t be afraid to sew your own clothes. Once you get the hang of the pattern, you can create a one of a kind wardrobe. Just remember, you are fabulous!